Roller Derby is an amazing support and despite being played by females, it is in no way a “girly” sport. It has a lot of action and violence which result in great entertainment. This video slot machine by Microgaming invites players to go watch a roller Derby match between two vicious teams so they can enjoy the sport and get paid in return. 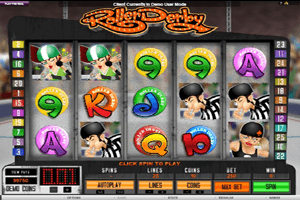 Play Roller Derby Slot here. The game has five spinning reels and a total of twenty five winning lines that players are invited by the game to place their wanted wagers on. They can do that as they go through the multiple betting options that can be found under the reels of the game. They can also click on Max Bet in order to place the maximum bet and initiate the game. All of the cons come in great visuals and they are all inspired by the sport of Roller Derby, this is why the icons include the different players of the two competing teams, the roller derby ball, the game’s logo and card symbols. Even the reels themselves are located inside of the Roller Derby court. The logo of the game is its scatter symbol that will trigger the free spins round in which online players can earn up to 5 free spins through the Lets Talk Derby feature. The wild pink skater shoes is the wild icon that can replace all symbols but the scatter logo to form winning combinations of symbols.